All of this for 2 people. So I got real, and even though some of these dishes were beautiful and yes, we would maybe use them in the future, I started to declutter, sell, and give away what I didn’t need. The reality is if we hadn’t used them in 10 years or only used them a few times over 10 years, we probably didn’t need them. 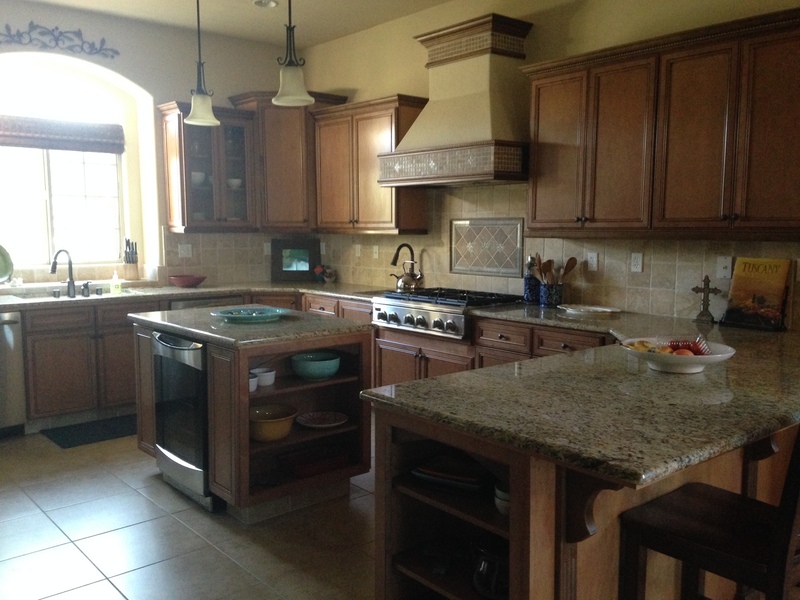 Decluttering your kitchen is a much more time consuming project than decluttering your closet. For these next few steps, you’re going to be focusing on decluttering, not reorganizing. The difference between decluttering and organizing is you’re trying to get rid of what you don’t need, not just rearranging and inordinate amount of possessions so it’s cleaner. The reason we’re taking everything out is to actually see how much you really have and what you use. Decluttering is getting rid of what you don’t need, not just what you don’t like. Depending on how much time you have you may have to split this up over a few hours or a couple of days and give it try! Before you start digging around in your cupboards, try and clean off what is already out on your counter. If you have miscellaneous items out on your counter (mail, bills, things that belong in other rooms) try and get that out of the kitchen first. 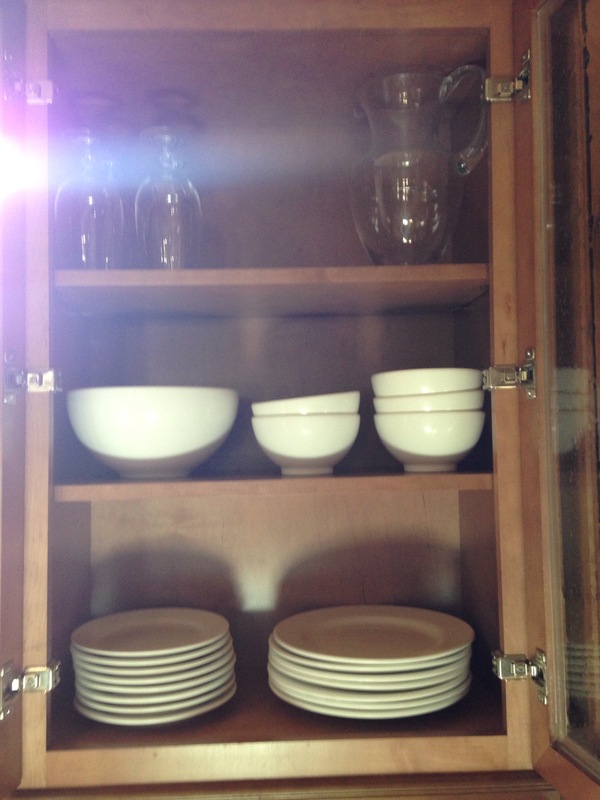 Take out every single dish, glass, mug, serving platter you own and place it on your clear counter or kitchen table. (Don’t worry about pots/pans baking utensils yet; this is just dishes and serving platters). Count how many plates, cups, mugs, serving bowls, platters you have. Then decide to keep what you really use or need. We kept a set of 8 everyday dishes, glasses and mugs, and a few serving bowls/platters. We got rid of everything else. We didn’t need 24 plates, 16 mugs, and 12 serving platters even though they were beautiful and we “might” have used them in the future, we didn’t need them. Think about the last time you had people over. How many real dishes did you use? How many serving platters? Do you need all that you have? If not, sell, donate, or give away what you don’t need. Put them back in your cupboards nice and organized! 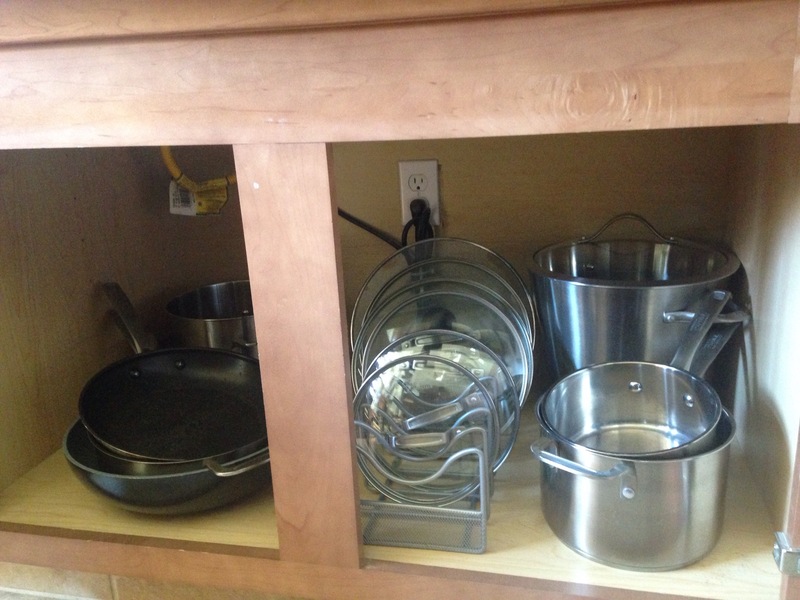 Take out all of your pots, pans, and bakeware (cookie sheets, cake pans, etc.). 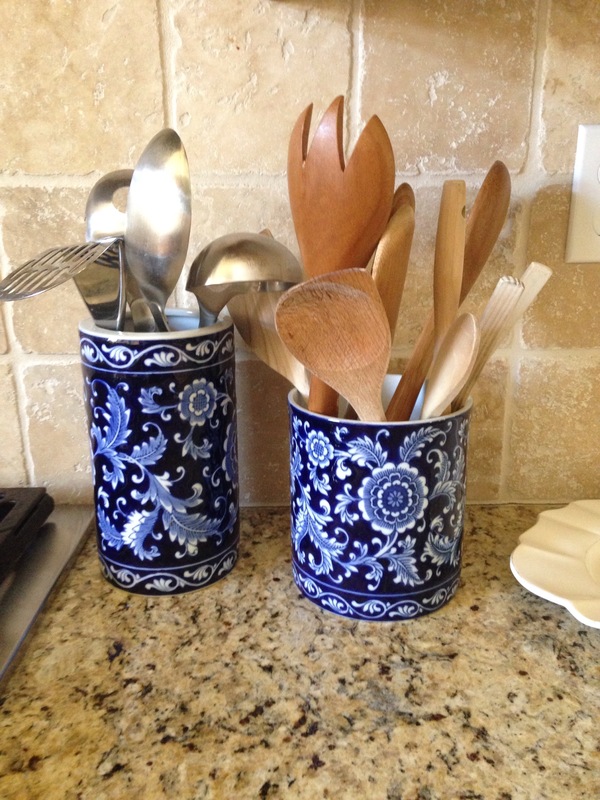 Separate items that you use regularly with items you use once in awhile or keep around “just because”. Sort through the items you rarely use. Do you have something similar? Is it necessary to keep? How often do you use it? Are you able to use it in more than one way? For example, I had a pot that was for steaming asparagus. It had one use, and I rarely used it, so I sold it. Do you need 10 cookie sheets, or 2? Figure out what you need and keep that. Take out all of your cooking utensils and gadgets (food processor, blender, cheese grader, etc.). Separate between what you use regularly and what you rarely use. Go through items you rarely use and keep only what you need. If a gadget is neat, but not really needed, or has too many parts and takes a long time to clean, get rid of it! A good knife should be able to do much of the prep work in a kitchen anyway, so get rid of those small choppers, avocado slicers, or clunky gadgets you don’t need! Keep one set of mixing bowls, measuring cups and spoons. Keep your serving spoons, wooden spoons, and good knives and the few utensils you need, sell, donate, or give away the rest. Take out all of your Tupperware and storage. Throw away (recycle?) anything that does not have a lid or any extra lids that don’t have a partner. 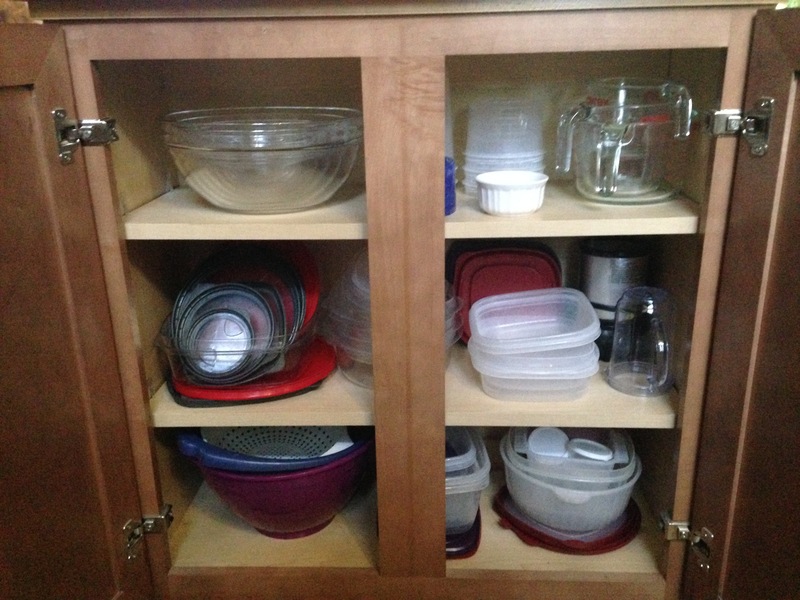 Keep only a few Tupperware/storage containers in each size. Stack lids together, and get rid of the rest. Go through towels, napkins and get rid of any with holes or stains (or use as cleaning rags). Keep enough towels for a week or two since these you can throw in the laundry. Keep 1-2 sets of cloth napkins. We have a fancy set and a set we use every day, we try to use real napkins often so we don’t waste paper products either. Placemats/chargers: I don’t really think these are necessary. They’re only for decoration so I only kept one set of 8. They’re more laundry and clutter on the table so I rarely use them. We have 2 plastic placemats that are easy to wipe off that we use for kiddos, but other than that, we got rid of the rest. 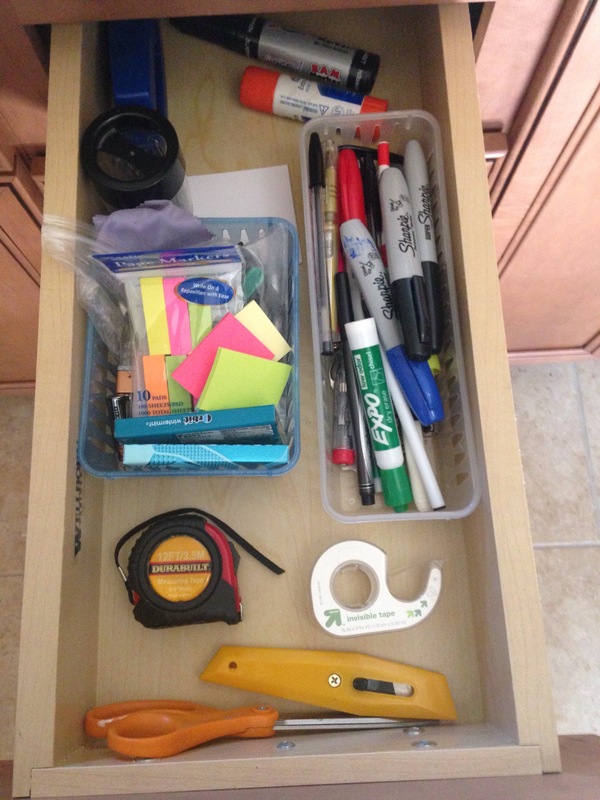 Yes, I have a junk drawer. I think we need a place to keep the miscellaneous stuff. I keep my pens, post-its, scissors, gum, batteries, etc. in my junk drawer. For the most part even this stays clean and decluttered because it should not be where we just stuff things and forget about them. Try to get rid of things as they come in! We rarely keep manuals. For the most things can be found online now or you can take a picture and keep it in Evernote. Get rid of as much paper clutter as possible! 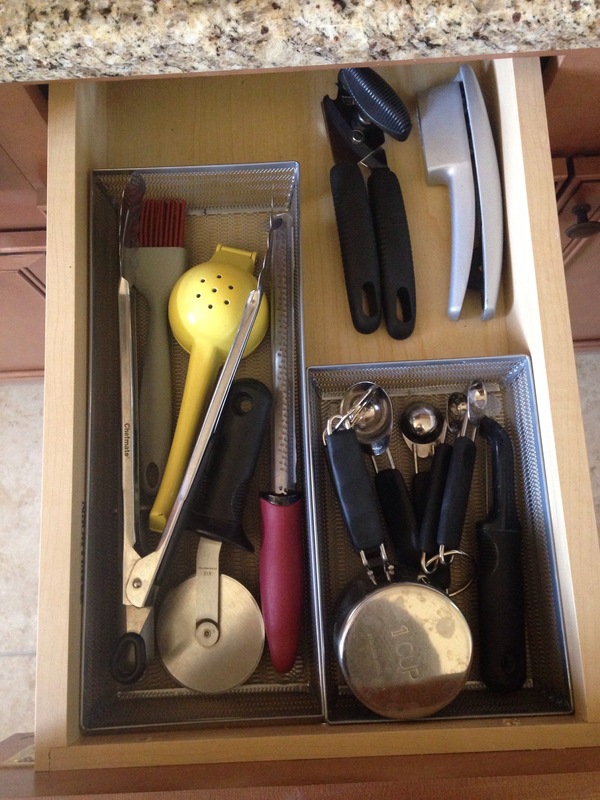 The kitchen decluttering process will vary for each of us. Depending how much we cook, bake, host/entertain, use paper plates vs. real plates, etc. If you use your stuff often, keep it. But ask if you really use it, or you just think you’ll use it? Do you really need your own _________, or can you borrow/share? Do you really need 40,000 wine glasses or will 4 do just fine? I keep thinking about our great grandmothers who cooked more than many of us (most likely) without all of these gadgets and utensils. I’ve found that most of us keep far more than we need in our kitchen because “it’s pretty” or “we might need it someday”. So rather than keep items based on those things, keep what you really need or use. I have gotten rid of so much in my kitchen and if there is something I need that I don’t have, I can borrow or buy. So far, that has happened once in the past few years. Hopefully these steps help, but depending on how much stuff you actually have, you may need to do each step on a different day or break it down over a couple of hours. Whichever way you decide to do it, let me know how it goes! I only have one question……what day and time are you coming over to do my kitchen? Lol!